Got Varicose Veins? Spider Veins? 50% of women. 25% of men. What do the two of these groups have in common? Both of them suffer from vein disease. According to Morrison Vein Institute, “veins are supposed to pump the blood in the legs back to the heart. But with vein disease, also referred to as venous insufficiency, the blood cannot get pumped back up to the heart properly causing blood pooling and a cascade of events over time” (Vein Disease Equals Varicose and Spider Veins article). Spider veins and varicose veins are symptoms of vein disease. There are actions that can be taken to minimize the effects of vein disease such as wearing compression stockings/socks, exercising regularly, and having a vein doctor treat your veins. Learn more about preventative care by clicking on the article below! Are you having compliance issues when it comes to patients wearing compression stockings? Are you constantly hearing complaints about compression stockings? Can you imagine if your patients actually liked wearing their compression stockings? Compliance would go way up and their results from vein treatment would be a whole lot better. Then you would be happy and the patient would be too. 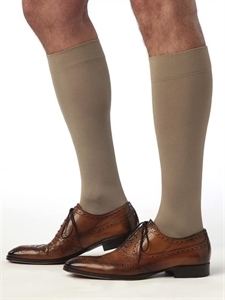 With the proper size and type of garment, graduated compression stockings can be comfortable. They also can be fashionable; yes we said fashionable. Several of the compression stocking manufacturers have figured out the perfect combination of comfort and fashion. There are so many more options for patients to choose from now, that everyone should be able to find something that fits their lifestyle and body. Graduated compression garments come in knee highs, thigh highs, pantyhose, leggings and shorts. There is everything from argyle socks to sheer knee highs to men’s trouser-looking thigh highs to tie dye pantyhose that look like tights and everything in between. Provide your patients with all of these options or a place like our store that does, and you will be a hero!